There are many different options when trying to determine the Titleist irons that will best suit your game. The 804.OS irons are made from forged stainless steel in a cavity back style. This model of has replaced the very successful DCI models. They have an oversize blade featuring a contemporary design and an enhanced offset. The characteristics of the 804.OS irons are what makes it a very versatile club for all levels of golfer. The head size is the longest in Titleist's lineup. The center of gravity is lower than what is found in the 704.CB model allowing the player to get the ball in the air more consistently. The offset also plays a big roll in getting the correct loft on the ball and enhances the ball flight direction. Finish of the 804.OS irons is a satin polish with a sand blast to the face, topline and cavity back of each iron. The sets are available in 3-iron to pitching wedge in both right and left hand available. 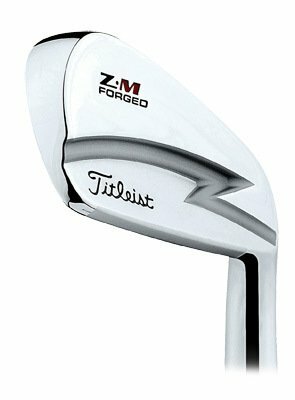 Special order for a matching 2-iron and gap wedge are available upon request. The standard shaft is a Dynamic Gold R-300 and they swingweight each club to a D2.